App Store: "Best of 2013" 9 European Countries. From the co-creator of Sony's blockbuster PlayStation franchise 'WipEout' comes 'Table Top Racing', a new, free, fast and furious, real combat racing game featuring console quality graphics and game play. 'Table Top Racing' pits all manner of crazy cars against each other in a world of table top race tracks and oversized obstacles. Ice Cream Trucks to Hyper Cars, it's all here in Table Top Racing. - In-Game Multi-Language Support: English, French, Italian, German, Spanish, Portuguese. With an awesome arsenal of madcap weapons and devious power-ups to play with, cars and tracks are brought to life with 'Triple-A' production values lavished on every pixel. The irresistible multi-player mode enables up to four 'frienemies' to engage in addictive, high octane battles over the net and also compete for the top spot on global leaderboards. Players can also win coins, upgrade vehicles, unlock new cars, expand their weapons cabinet in a bid to blast their way to the front of the grid. Simple, responsive controls make 'Table Top Racing' instantly playable with super smooth frame rates on all supported devices delivering a stunning racing game experience that all mobile gamers will enjoy. Note: iPhone 3GS/iPod 3rd are not supported so please do not buy and THEN leave a poor review. Thanks. 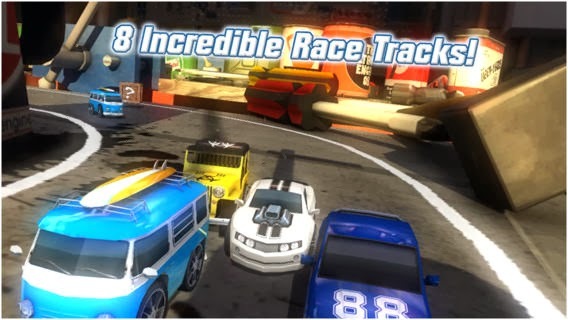 Table Top Racing has been awarded the prestigious "Best of 2013" by the European App Stores in France, Germany, Belgium, Netherlands, Italy, Luxembourg, Austria and Switzerland! Thank you everyone for your support.